The earliest known traces of human activity in Dollar were two burial mounds or cairns – one in the Old Town and one in Cairnpark Street. Both were opened by around 1800, but the vessels they contained have been lost. A Bronze Age (c. 1500 BC) cinerary urn was dug up in Kellyburn Park in 1957 – it can be seen in Dollar Museum along with other early finds from the Hillfoots area. In the field to the east of the Kelly Burn, a Scheduled Ancient Monument - a circular crop mark found by aerial survey - has been identified as a palisaded Iron Age settlement. The Picts who lived in this area have left no carved stones, but the prefix ‘Pit’ lives on in such names as Pitgober and Pitfar. The local tribe were the Maeatae, their principal fort being on Dumyat (Dun Myat). The name ‘Dollar’ first appears in written accounts of the Battle of Dollar. In c. 877 AD, Constantine II (son of Kenneth MacAlpin), King of Scots, fought the Danes at ‘Dolair’. The Danes won, many of the Scots were slain and the rest were pursued into Fife, where Constantine was killed. 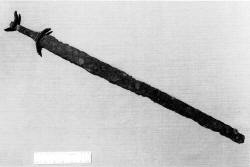 In 1802 AD, a sword (see photo) was dug up at Harviestoun during construction of the water garden. It was thought to be of Viking origin and possibly connected with the Battle of Dollar. Experts now say it is 9th–10th century and not Viking. The sword is on display in the new Museum of Scotland in Edinburgh. In 1336, the English fleet was in the Firth of Forth and ‘overran Fife and Forthreve, and laid it utterly waste as far as the Ochil Mountains’. Coming to Dollar, they found the church ‘which is acknowledged to belong directly to St Columba’ being rebuilt. These ‘limbs of the devil’ carried away the ‘choice and marvellous woodwork’ to their ships. As they sailed past Inchcolm Island, they sank in the raging waters ‘in the twinkling of an eye’. The church then being rebuilt would have been to the south of the Old Kirk. Castle Campbell showing "Knox's Pulpit"
Colin Campbell, the first Earl of Argyll, acquired the Castle by marriage and changed its name to ‘Castle Campbell’ in 1489. 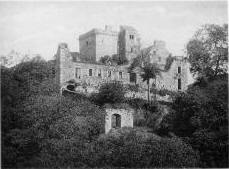 For centuries the Castle was the Lowland residence of the Earls of Argyll, a convenient base when the Royal Court was at Stirling, Linlithgow, Falkland or Edinburgh. The Earl’s tenants in Dollar owed duties in kind: for example, to supply oatmeal, barley, poultry and beer to the Castle and to fetch coals from Sauchie. In July 1556, John Knox visited the 4th Earl, who was one of the first Scottish noblemen to embrace Protestantism. Knox is said to have preached to a large congregation from the knoll known as John Knox’s Pulpit, before leaving for Geneva. In 1565, during the Chaseabout Raid, Mary and Darnley passed close to the Castle and received its surrender. Montrose’s troops passed through the Hillfoots in 1645 before the Battle of Kilsyth and, in an act of revenge on Argyll, burned Dollar. The Earl was in residence at the time, but made no attempt to defend the village, even when the MacLeans gathered at the Castle gate and taunted the garrison. Dollar villagers suffered much hardship: they lost their houses, their crops and their farm animals. In July 1654, during Cromwell’s Protectorate, supporters of Charles II attacked and burned the Castle, which was then garrisoned by English soldiers. The Castle was not rebuilt. It was bought by Crawfurd Tait of Harviestoun in 1807, and as a romantic ruin attracted early tourists such as Pennant, Robert Burns and Sir Walter Scott. 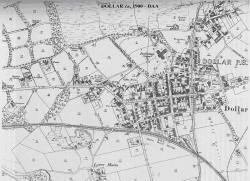 At the beginning of the 19th century, Dollar’s population was around 500, most houses being concentrated in the Old Town, Upper Mains and Lower Mains. The present Back Road was the main road from Stirling to Kinross. Self-sufficient in most trades, the village also had a bleachworks, some small coalmines and a woollen mill. The school was a single-storey house with a low-ceilinged room, 16 feet square. Enormous changes followed. 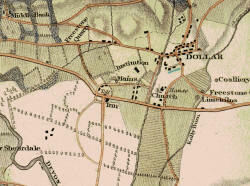 The first was the building of the TurnpikeRoad (now the MainRoad), rapidly followed by the building of Dollar Academy in 1818 and the feuing out of the New Town. By 1841, the population had increased to 1500. The Old Kirk was too small and the present Parish Church was built. The completion of the Devon Valley Railway in 1871 linked east and west Scotland. As Dollar Academy grew, education became the main industry and Dollar gained the name, the Classic Burgh. 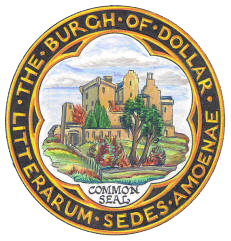 Dollar became a Police Burgh in 1891 and could then elect a Town Council and run its own affairs. The first Provost was James Henderson, the local chemist. The Academy continued to attract new residents to Dollar and, particularly from the 1950’s, new housing increased the size of the village. It is convenient for commuting to much of Central Scotland. A devastating fire in the Academy in 1961 gutted the Playfair building. It was rebuilt inside the original shell with three storeys of classrooms instead of the original two. The Queen visited Dollar in 1963 and left by train, but the following year, as part of the Beeching cuts, the railway closed to passengers. Strathdevon Primary School replaced the old Board School in 1964. Dollar Mine closed in 1973 and the railway line was taken up and replaced by a walkway. The congregations of the West Church and St Columba’s united in 1975, the West Church was sold and the old U.P. Church in East Burnside was bought as a church hall. A new Health Centre was built in the Market Park and brought all medical resources under one roof. In 1975 Dollar Town Council was abolished when local government was restructured. In the 1990’s a new Civic Centre was opened in the Market Park with facilities for local groups and housing a council office and library with public computer access. The village has continued to grow as new housing developments spread out in all directions. The village has grown with new housing developments in all directions. This growth continues in the 21st century. More information on the History of Dollar may be found in Dollar Museum.